Laptops are fun and more popular than ever, but they are still computers and come with their own set of issues: easier to steal, more likely to be dropped, often dependent on wireless Internet access, and other concerns. If you're entering the computer world as an older adult—and wondering about laptops—this straightforward, helpful book is for you. Written in full color with lots of screenshots and clear, easy-to-read type, this friendly guide walks you through the process from start to finish: selecting which type of laptop is right for you (PC or Mac? ), handling setup, safely adding wireless Internet access, staying secure online, and much more. Prepare properly, enjoy the freedom, and maybe even show the kids a thing or two with this fun and practical guide! Bud Smith (London, UK) is a leading computer book author and technology company consultant and manager. 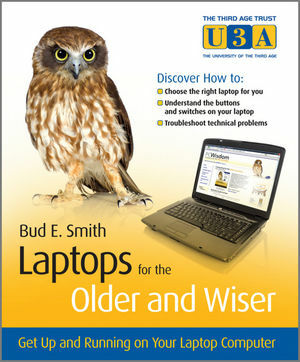 Bud has been writing computer books for more than 20 years, on topics from microprocessors to computer buying to Web authoring to use of Google tools. His best-selling book is Creating Web Pages For Dummies, currently in its 9th Edition, and his books have sold more than a million copies. Icons used in this book. Part I – Getting your laptop. Chapter 2 – Choosing the right laptop for you. Choosing the type of computer. Chapter 3 – Understanding laptop specifi cations. The parts you can see and feel. The parts you can't see. Chapter 4 – Buying your laptop. Shopping online for a laptop. Finding a laptop in the shops. Chapter 5 – Buying broadband. Buying your laptop in a package deal. Chapter 6 – Bringing your laptop home. Setting your laptop up at home. Chapter 7 – Customising the Windows desktop. Part III – Getting up and running. Chapter 8 – Getting power to the people. How your laptop uses power. Chapter 9 – Staying connected. Wireless connections at home and away. Finding and choosing a wireless network. Alternatives to a wireless network. Chapter 10 – Using your laptop’s software. Using word processing and spreadsheets. Chapter 11 – Learning what you can do online. Finding videos, music and more online. Chapter 12 – Preventing problems.